With picture books, you can read aloud the entire book fairly fast. Not so with the type of books I write--long nonfiction books. As I write these I will occasionally read aloud sections that I’m working on to get the feel of how it flows. But they are way too long to read it aloud in one sitting. Most often my experiences with reading aloud takes place at school visits. Sometimes my host school asks me to talk about the topic of one particular book. Sometimes they ask me to talk about research or close reading. At least once during a school visit, I read aloud to the audience-regardless of their age. To do this I set up the context of the scene so it will make sense. 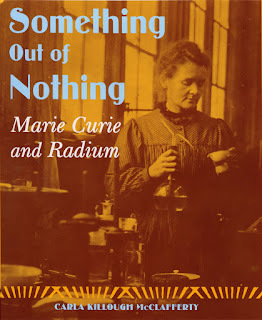 Something Out of Nothing: Marie Curie and Radium. In this book, I want the reader to see Curie as a woman first, and scientist second. I explain who Marie Curie is and what she has done. Then I read aloud the section of the book when Marie comes home to find out that Pierre has been suddenly killed in an accident. I want listeners and readers to feel her loss as she grieves the loss of her beloved husband and co-worker. In cases like this one, hearing the scene read aloud is more moving that reading it silently would be. Next I cover the fact that she continued her work regardless of her grief and was awarded her second Nobel Prize for it. Again, I want them to get that Curie was a woman first and scientist second. I love that you read your wonderful work aloud at school visits, Carla. I think some adults forget that reading nonfiction aloud to children is as important as reading fiction to them.